Developing a website is not easy. So, you need lots of time and effort to make a website stand out. When the content of your website starts to grow, it might be challenging to manage and represent it properly. Employing WordPress as content management system helps to manage your website in a better way. Even though WordPress is a powerful tool and widely used, it may not always do everything you wish. WordPress comes with various plugins that help to extend the functionality of your website and make it stand out. The plugins serve as an approach to extend and add the functionality which is previously available in WordPress. The foundation of WordPress is developed to improve the flexibility minimising the code. Also, the plugins provide some tailored function with features allowing users to customise the websites with the particular requirements. There are varieties of WordPress plugin accessible with no charge from a plugin directory. And, the paid plugin mostly provides complete time support for developers working to maintain security and compatibility of the plugin. Willing to start your own blog and receive comments from your targeted audiences? You might have lots of problems as many comments may not be authentic and important, some might be spam comments. Integrating Akismet plugin differentiates spam and genuine comments. Also, it helps to identify the spam comment which might be troubling you to decide among positive and negative feedbacks. These feedbacks can obstruct on the rankings as well. The well-admired plugin WordPress SEO by Yoast does not only include in SEO plugin but also the complete website optimisation package. Along with adding up titles and description to your blog post, it also benefits you adding up open Meta-data along with performing some page analysis, publishing XML sitemap and more. Besides, it is simple to install and setup so it is utilised in various websites. Through this plugin, you can develop an XML sitemap for your website as well. The most well-recognised cache plugin for WordPress W3 Total cache allows websites to load quickly for superior customer experience with high ranks within the search engine. The plugin mostly provides different preferences or choices for optimising your website. If configured properly, you will be able to observe variations in terms of presentations. Additionally, it magnificently goes with Amazon CloudFront for cost-effective ways of conveying the content employing Content Delivery Network (CDN). All in one WordPress plugin, Jetpack offers an extensive range of remarkable features with different handy functionalities. It lets customise your website, add themes, organise content, includes protected login and analyses performance. The plugin profits you with different services like social sharing features, contact form, CDN service, e-mail subscription and many others. One of the best security plugins, Wordfence security adds up an additional layer of protection locking an individual who attempts to take access to your WordPress site. It also blocks IP addresses of bots attempting to enter in your website. The plugin lets you customise the email alerts when it finds any doubtful activity. It also provides a premium version allowing you access to support once you require it. It is well admired and downloaded by maximum users as it provides a deep server-side scan of the complete source code. Are you planning to run an online shop? If so, WordPress plugin WooCommerce surely comes to your help. This plugin facilitates you with different features like PayPal implementation; evaluate sales report, simple and convenient coupon submission, various shipping approaches as well as useful and effective inventory management. Additionally, the plugin can be modified according to the requirement of your company. Today, to make your business popular among your targeted audiences, better develop a social network. WordPress plugin BuddyPress provides you complete guidance to manage various social networking sites on WordPress including member profile, activity stream, user group, messages and more. Additionally, it also offers some features to develop a community where you will be able to enclose a friend list, private conversation, make groups and anything you organise with social networking sites. WordPress plugin Gravity forms can be very effective for beginners and developers welcoming contact form plugin for CMS WordPress. The plugin is mostly used in all the types of the online form on your WordPress site. It appears with an influential add-on developing an online survey, user submitted the post, web directory or anything where user input is necessary. One of the most liked WordPress plugin SumoMe offers varieties of features along with the tools free of cost which is essential to develop a WordPress website. This type of WordPress plugin makes convenient for audiences to connect with your email list, share your post and optimisation with analytic. It also allows simple allocation on various social media integrating email with MailChimp, Constant Contact, campaign Monitor and more. WordPress plugin OptinMonster lets many users generate beautiful and attractive forms and a popup for the WordPress site and switch user into subscribers. It appears packed with various characteristics like page level targeting, analytics, split test plus exit intent technologies which let you show option form at the time users is about to go away from your website. Larger images might slow down your website. WP Smush optimises your images making them occupy less disk space with no impact on the visible quality of an image. Also, it cuts all the unwanted data and scales it for you earlier than you add it to your media library. Look for advanced compression stats per attachment and library totals. As a business proprietor, your top priority is to allow your customer to connect with you easily. 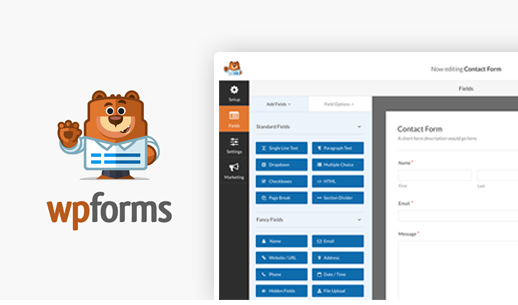 WordPress Plugin WPForms is the most novice friendly contact form. The drag and drop online from developer lets you develop contact forms, emails subscription forms, order forms and more just with some clicks. Testimonials Widget allows you randomly slide or list the preferred portfolios, review or text with images or videos on your WordPress site. Also, you can include testimonials content through shortcode theme function or widgets with category and tag selection with various display option like random and specific ordering. I hope you enjoyed reading about the best WordPress plugin that you require for a successful business. Numerous WordPress plugins are available online. And, it is very important to pick the one that meets your business goals. These are our choice of plugins when it comes to configuring a website with the brute force of effectiveness. What do you recommend? ?